All Artworks exhibited will also be displayed on the CAS website at the end of the exhibition. An initiative of the Contemporary Art Society of Victoria Inc.
Vitreous: ceramic, glass & mosaic contemporary art pieces in an astounding range of styles and subjects - a delight to the eye and the imagination! We are thrilled to be able to invite you to our Vitreous and Contemporary by Nature exhibitions opening next Saturday 9 FEBRUARY at 12 noon at the Herring Island Gallery (South Yarra, Melbourne). See links below for info on how to get there. If you can't make it to the opening, don't worry, the exhibition will be on every weekend for 6 weeks until 17 March (Sunday). It's wonderful to see what skill, originality and beauty have been conjured by our artists working in so many different mediums to create works in a stunning range of styles, sizes to suite every wall-space, and subjects to fire the imagination - all for sale! Refreshments will be provided at the opening, and it'll be a nice opportunity to get together with friends and fellow art-lovers to meet some of the artists who will be present at this auspicious occasion. Our Vitreous and Contemporary By Nature Exhibitions run for 6 whole weeks on the weekends of 9, 10, 16, 17, 23, 24 February & 2, 3, 9, 10, 11, 16, 17 March. 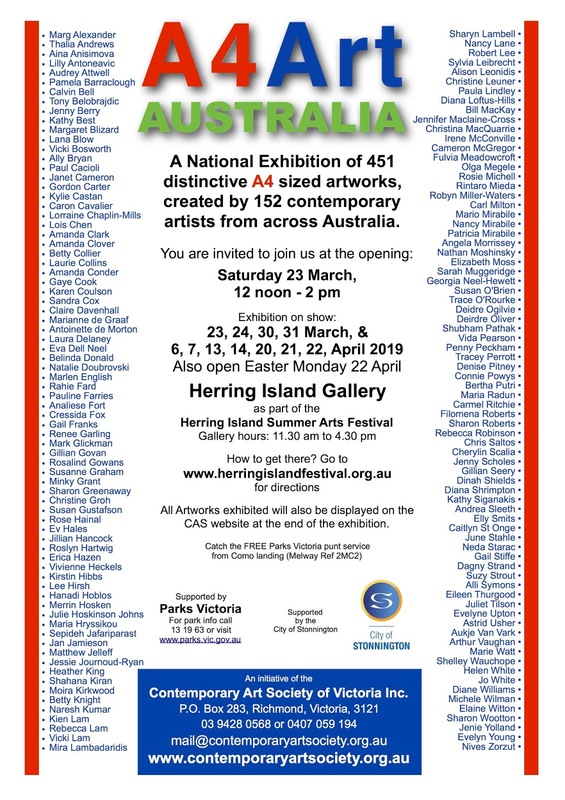 Gallery Hours 11:30am to 4:30pm, and access to Herring Island is by the FREE Parks Victoria Punt which leaves regularly during Gallery open-hours from the Como Landing, South Yarra (near the intersection of Alexandra Avenue & Williams Road and the Kanteen Café). See HERE for more information on how to get there, and also HERE on the CAS website. The exhibition is proudly supported by The City of Stonnington and Parks Victoria. 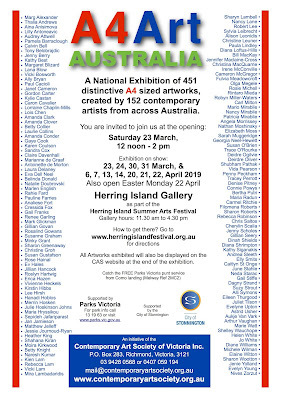 Herring Island was looking good for the launch of the 2019 Summer Arts Festival. Parks Victoria have put in the work to upgrade the paths. Against this backdrop visitors were welcomed to the gallery by the exhibition "Meander" an offering of 49 sculptures from members of the Association of Sculptors of Victoria. The Festival was launched and the first exhibition opened by Robert Lee, Coordinator of the Festival and President of the Contemporary Art Society of Victoria and Gillian Govan President of the Association of Sculptors of Victoria. Sculptors will be running demonstrations of sculpture techniques in the gallery courtyard throughout the "Meander" exhibition. On Monday 28th January there will be demonstrations not only from the sculptors but also artists from the other groups participating in the 2019 Festival. This exhibition runs until Sunday 3rd February. Contact us or subscribe to our invitation list.